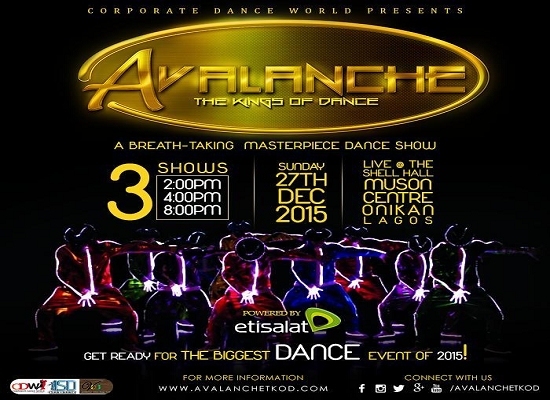 Click to enlarge Corporate Dance World Presents: AVALANCHE - THE KINGS OF DANCE! It is the BIGGEST dance show of 2015 featuring the best Names/Personalities/Companies in the Dance industry. Household names like Wale Rubber, Kaffy, Victor Phullu, Frank Konwea, Ijodee, Soul Quest, Ice & Ukalina, Lovette, Lilian Yeri, Stars on Earth, Apex and so much more! These Amazing ladies and gentlemen have conquered the land and built kingdoms and thus, are worthy to be called KINGS! And that's not all! We have the backing of our"Special Ones"! They are Dance lovers who are kings in the entertainment industry. An awesome lineup of OAPs (Radio), Comedians, Musician sand Movie industry stars such as Ali Baba, Ireti Doyle, Linda Ejiofor, Victor Olaotan, Uncle Ben, Manny and The Angels (Cool Fm), Sensei Uche (City Fm),Showman, Yinka Davies and others, join our Kings Of Dance in this epic,breathtaking dance masterpiece! Even COMEDY would be done in DANCE. Ticket Cost - NGN 35,000, NGN 500,000 (Platinum & Table) - Table consist of 10 people. Bullet Description: AVALANCHE: KINGS OF DANCE is a dance festival created to showcase the best dancers in Lagos and in Nigeria.